Polish legislation banning phrase 'Polish death camps' or claiming Polish collusion during Holocaust goes into effect. 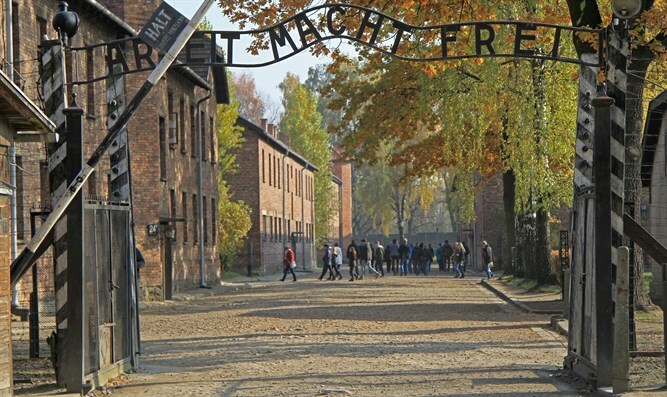 A controversial Polish law censoring certain claims regarding the Holocaust and banning the use of the phrase “Polish death camps” went into effect Thursday, following a delay in its implementation last month. Last month, Polish President Andrzej Duda signed the bill into law, after it passed by wide margins in both chambers of the Polish legislature. The law bans the phrase “Polish death camps”, and outlaws claims of collusion by the Polish nation with the Holocaust. Anyone found guilty of ascribing “responsibility or co-responsibility to the Polish nation or state for crimes committed by the German Third Reich” could be sentenced to as much as three years in prison under the new law. Last week, Poland’s Justice Minister announced that implementation of the law would be delayed, while a constitutional tribunal ruled on the legislation. "Due to Israeli pressure, the Polish Justice Minister announced that the law will not be implemented before the Constitutional Tribunal rules on the matter. A Polish staff is expected to arrive in Israel with the intention of reaching an Israeli-Polish agreement," an official Israeli source said. The Holocaust censorship law drew heavy criticism from the Israeli government, with the US State Department also expressing opposition to the bill. Polish opposition parties also criticized the law, and proposed to amend the bill. The Yad Vashem, World Holocaust Remembrance Center in Jerusalem opposed the law as well, while also noting that blaming Poles for the Holocaust and use of the phrase “Polish death camp” is unfair. On Thursday, a Polish delegation made up of diplomats, government advisers, and historians landed in Israel on Thursday to meet with top Israeli officials in order to reach a compromise with Israeli leaders over the controversial law.